Hi loves! It's Friday again, woohoo! I just love Friday's haha. Any plans for the weekend? We are visiting my boyfriend's niece this Sunday, we planned to a few weeks ago but the snow was so bad that day - I don't like driving through the snow.. 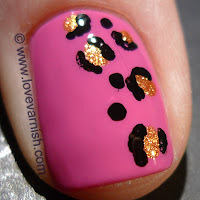 Anyway, today another manicure that was inspired by (and mostly copied from ;-)) Marta from Chit Chat Nails! She did this one as part of a twin post with Nusa from Moonchild, and I just loved the combo of leopard print, glitz and dots. I first wanted to recreate with a baby blue, but I just felt like wearing OPI Kiss Me On My Tulips and figured it probably would work well with pink, too. It did! So from thumb to pinky, here is what I did and used: Thumb - OPI Kiss Me On My Tulips (2 coats), freehanded leopard print using a medium and small dotting tool and OPI Rising Star and Wet 'n Wild Black Crème. Index - OPI Kiss Me On My Tulips (2 coats) topped with El Corazon Dalmatian (2 coats). Middle - OPI Kiss Me On My Tulips (2 coats), freehanded leopard print using a medium and small dotting tool and OPI Rising Star and Wet 'n Wild Black Crème. Ring - OPI Rising Star (2 coats). 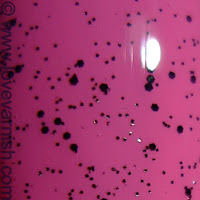 Pinky - Wet 'n Wild Black Crème (1 coat) dotted with a small dotting tool and H&M Love At First Sight. I just love the little black specks on my index nail, from the El Corazon Dalmatian topcoat. It is applied so easily and very versatile, I can see this working over a ton of colors. Maybe I'll try it over a red, kinda like strawberry nails ;-). Do you like this combo? And how'd you pair the El Corazon Dalmatian topcoat? Love this! Do you know if there is any way to buy El Corazon in the US? I need that polish! I love the idea of the leopard print on the side of the nail, you do this mani well! Awesome! It looks good in pink! I like her style too. Hi Erin, thanks for your comment! Unfortunately I have no idea - I don't think there is. But, maybe there are some Russian girls hanging out at http://swapandorder.forumfree.it/ it is a recently started forum where you can arrange swaps and orders. I do too :D! Thanks dear :). And SO easy to do! Thanks dear ♥. Thanks! It is so versatile! Thanks so much Marisa, you are always so sweet ♥.